Is a job interview more like chess, or poker? Or should it be played or seen as like neither—and more like a cooperative exercise in “getting to know each other” with “win-win” for both sides as the goal? How can you tell how your interview is being or should be played? The way you see or play the interview will alter not only your perceptions, moves, disclosures and expectations, but possibly also the actual outcome, satisfactions and disappointments. If you regard an interview as having no chance elements, apart from the initial pairing of the participants, you may, thereafter, expect it to proceed like a chess match—on some level a strategic and tactical interaction, normally with no additional elements of chance, and with an eventual winner and a loser, or a stalemate or a draw. Of course, there is a remote chance that some additional chance factor will play a part—e.g., if one of the players falls ill and forfeits. This expectation of a combination of low-chance-plus-high conflict is in sharp contrast with the idea that the acceptance of a job offer is supposed to be “win-win” for everybody [an outcome not allowed in chess]. Moreover, if the interview model is chess, then to the winner go the spoils and the full credit, “Lady Luck” being entitled to take no bow or blame for the outcome. That means a more robust sense of accomplishment, pride and bragging rights than a poker-style chance-influenced interview can afford. It also means “no excuses” for interviews that have gone bad—apart from “fouls” on the part of one of the players, not unlike continuous, thunderous and faked tactical coughing by a win-at-any-cost chess master bent on rattling his opponent. The reason “win-win” cooperative interview outcomes may be illusory or not guaranteed is that, unlike chess, but like poker, the interview, no matter how “cooperative”, is characterized by outcomes that depend on the “bidding”—viz., the employer’s ante, bidding and betting on the candidate, the recruiter’s doing the employer’s bidding [in more than one sense] and the candidate’s antes and service/talent offers as “bids”. Remember that one of the key features of a “zero-sum”, “I win-you lose” game is competing interests—a feature job interviews share with both poker and chess, despite the hearty interview handshakes and happy smiles all around. No matter how great the match between the candidate and the company, it will always remain true that if the employer were able to successfully give less or get more, that’s what it would or should do—as a “rational player”, while if the candidate were able to extract more or give up less, [s]he would or should too. Eventual agreement, offer and acceptance of an employment contract can, in some respects, be interpreted as being, to some degree, a “lose-lose” as well as a “win-win” outcome, when each side compromises more than it wanted to in order to seal the deal. It can also be a clear “win-lose” outcome, despite the agreement, when one side does all the compromising. If you see an interview as being more like poker, other concepts not found in chess or in cozy cooperative collegiality come into play—including some inapplicable to chess, e.g., bluffing, raising the ante, the existence of an unseen “hand”. By contrast, on the chessboard, the available resources and their distribution are evident because they are entirely in the open and “above[the]board”. Straight poker, which features hidden cards in one’s hand, however, has essential elements of secrecy and stealth, as well as chance, the latter in the form of random dealing of cards, beyond the control of any of the participants. This is one antithesis of the cooperative “win-win” interview dynamics, chess being another. Although the strategies employed are ideally hidden in both chess and poker, the actual moves are far more opaque in poker—despite the fact that the underlying player rationales for them are equally concealed from other players, in both games. Hence, a poker-style interview will have more hidden and chance elements than a chess-style interview and infinitely more than an utterly candid and forthcoming, cooperative “win-win” open-as-a-window interview. 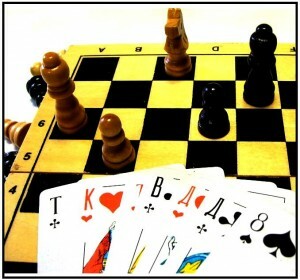 Therefore, anyone who sees the interview as a win-win purely “cooperative game” and also as a game of “perfect information”—namely without any information hidden and with no subterfuge, will generally be at a disadvantage if paired with a “player” who sees and plays it as either poker or chess, i.e., as a strategic and tactical battle of wits and moves. In that case, and despite the adversarial mindset of both poker and chess interview players, recognizing the differences between the latter two may help reduce, if not eliminate the disadvantage of being a “Pollyanna” win-win-oriented player. So, how can one tell if the other player is treating the interview like a game of chess or a round of poker, and what difference does that awareness or the format make? 1. If the other player is following a chess format, there is likely to be a greater emphasis on using or manipulating what you do know, rather than on what you don’t. For example, a chess-oriented interviewer or candidate is likely to dole out accurate information in order to elicit a desired response or to gauge a revealing one. Now it’s your move: If you are following a cooperative “win-win” game plan and believe the interviewer is too, you’ll take his “candor” and reassuring openness as your cue and probably blurt out something like, “Wow! That’s scary!”, as opposed to a chess player’s calculated tactical response, e.g., “I love a challenge”—itself a move designed to elicit or gauge a follow-up response. But how can you tell? One clue is whether the information being presented to you seems designed primarily to express information more than to elicit it. The former suggests open cooperation, the latter—a chess move. Of course expressing information is not inherently more cunning that eliciting it, but think of immigration officers and their priorities, which lean heavily on eliciting information for the purpose of trapping liars and the otherwise dubious traveler. Another is whether the information appears to be part of an open, spontaneous brain-storming interaction, a third “e”, namely, exploration—suggesting the absence of a manipulative “agenda”. In any case, open, honest information that appears to be presented with elicitation of responses as the primary purpose is likelier to be a chess move. 2. If the other interview player is playing poker with you, there is likely to be a greater emphasis on using or manipulating what you don’t know, rather than on what you do know, and on capitalizing on your ignorance. This also means a probable use of deception and subterfuge analogous to bluffing in poker, in contrast to the cunningly set traps of chess, which always depend on an opponent’s missteps and miscalculations regarding the out-in-the-open, visible pieces and moves. For example, the interviewer conceals the fact that the company is about to be absorbed in a merger, with mass layoffs looming as a likely outcome. Instead, he talks about possible opportunities for advancement that are in fact, limited or non-existent, given the pending merger—as a kind of bluff designed to induce you to bet heavily on the company. In the end, after you’ve “won” the job and the merger is completed, you discover that the interviewing “poker-playing” recruiter cleaned up and took you to the cleaners. So, again, how do you tell? Obviously, the higher the ratio of too-good-to-be-true to credible content, the higher the likelihood that you’re dealing with a poker player. Although too-bad-to-be-false content, e.g., brutally blunt or intimidating interviewer comments, may indicate you’re in an “open” no-secrets game of “perfect information”, it could, nonetheless, be a manifestation of poker tactics. First, that “bad-news” honesty may be a ploy to establish credibility and balance for the purpose of getting you to trust everything you are hearing. Research shows that throwing a negative comment at someone, as a spice on top of positive comments, can have the positive result of winning his or her trust and conviction that the positive stuff is not manipulative, e.g., motivating disingenuous flattery or fawning. Example: When a teenage brother who wants the last slice of pizza tells his teenage sister that her prom dress makes her look fat, but that her shoes are fantastic and that overall she still looks great, she’ll believe it all—and happily leave for the prom, and just as happily leaving the last slice to him. Third, such negative comments and content—about you, the job, the organization or the business sector, may function as a test and a kind of upping of the “ante”, to see whether you’ll see and hold, or fold. “Some of our volunteers have been eaten by lions”—said to a wide-eyed Africa-NGO applicant—would be a good illustration of this. 1. If you favor it, encourage or accept a “win-win” collaborative interview format—but immediately switch to poker or chess if you sense you are playing a game of open solitaire, i.e., the other player has other non-win-win plans and games in mind. 2. Allow for the possibility of a mixed format—that at some point or points in the interview the format can change or be switched and switched back by one or both players. This means staying very agile and alert to not only the moves within the format and game, but also to moves from one format to another. 3. Reflect on whether to counter a chess format with a chess format of your own, or to switch to poker. 4. Assess the role, if any, for chance or concealed elements in the interview format that could shift the interview from chess to poker, or vice versa. Now, is all of this good advice? You can bet on it, or not. But, in any case, the next move will be up to you.